Electric utility structures may provide nesting substrates for some bird species, including osprey, eagles, hawks, ravens, and kingbirds. Nests may be located on distribution and transmission poles, as well as substations (pictured: Osprey nest on platform-left, Red-tailed Hawk nest in substation-right). Depending on where nests are located, they may pose fire, safety, power outage, or bird electrocution risks. Nest management may be conducted to minimize risks associated with bird nests on electrical equipment. 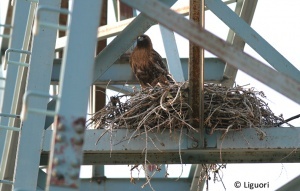 Management actions may include trimming nest material, removing nests, or relocating nests to platforms installed on or near utility structures. Relocating nests for platforms can provide nesting sites for protected species while minimizing risks of electrocution, equipment damage, or power outages. Utilities should consult with state and federal wildlife agencies to identify permits that may be required for nest management activities. A variety of nest platform designs are available (see Suggested Practices for Avian Protection on Power Lines: The State of the Art in 2006 for designs). 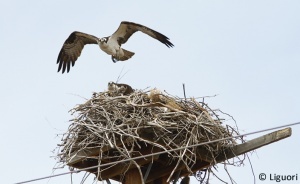 For decades, nest platforms and boxes have also been installed on utility poles to aid populations of sensitive raptor species, including Osprey and Peregrine Falcon. They continue to be installed to benefit rare or declining raptors such as the Ferruginous Hawk (pictured, right). 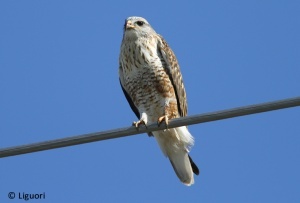 For detailed information on bird nests on utility structures, see APLIC’s document Suggested Practices for Avian Protection on Power Lines: The State of the Art in 2006.